Another year, another halloween, and it would seem that we are once again in the age old dilemma of what to be. I have been everything from a princess to queen of the lawn gnomes and many scarecrows in between, however the pressure to come up with a good costume has never been so great as when Buzz was born. Even when he was a teeny fetus in my belly he was part of our costume, I went as Juno, my husband went as Pauly Bleeker, and Buzz played the part of baby in the belly. He did a very good job. Last year we were already thinking about which costume he would wear all the way back during the summer. We had ideas and plans and then a friend mentioned that with his pale skin and chubby chins he looked like the Stay Puft Marshmallow Man. And so a costume was born! E and I even went as Ghostbusters, the only problem that we have now is that we have a ton of pressure come up with a costume that is even better than last years. Ideas? 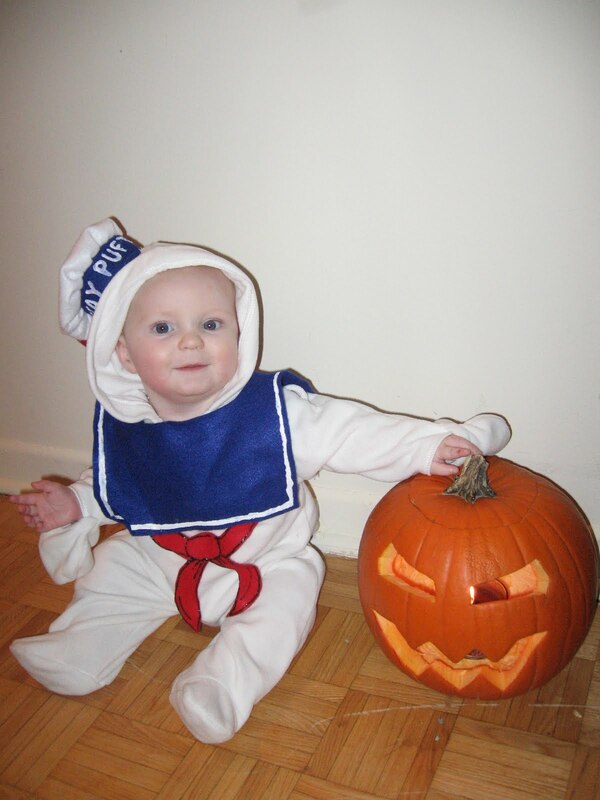 Check out the instructions below to make your own baby into the Stay Puft Marshmallow Man. 1 white outfit. It works best with a hood as well, but a white infant hat would be fine instead of a hood. We used a white fleece one piece outfit with a hood. Halloween tends to be a little cool in Canada, so it was great to have the extra warmth. 4 pieces of felt. 2 royal blue, 1 red, 1 white. you will also need a sewing machine (or you can hand sew everything) and scissors. Because the main part of the costume is already done with the white outfit the only things that need to be handmade are the hat and the collar. Cut out the shape shown in the picture out of the blue piece of felt. Sew two pieces of ribbon at the top of the opening so that they can be tied together. Cut the red tie shaped piece out of the red felt and sew onto the front of the blue piece. Use white fabric paint to make the white line around the blue collar. Alternatively you could use white ribbon and sew the line on, but the white fabric paint is super easy and quick. Use black fabric paint to add realistic detail to the red piece of felt. You will need to cut out a large circle from the white. If you use a round dinner plate to trace a circle before you cut you will have the perfect size. Cut a small circle from your second piece of blue felt or from your scraps. This should be a bit bigger than a toonie, don't worry, it doesn't have to be exact as it will look just fine in the end. Also from the blue you should cut a strip that is about 4 inches by about 11 inches. You will also need to cut a red piece in the shape of two pieces of ribbon, its easier if they are attached at the top sort of like a wishbone. Now for the the construction of said hat. you want to layer it so that the white circle is on the bottom, the red piece is on top of that and the blue circle is on top of that (refer to the picture). Be sure to centre the blue dot in the middle of the white circle. Sew around the edge of the blue dot securing the red piece as you go. You may find it helpful to pin it although I find that the felt sticks together nicely. Next fold your long blue rectangle in half lengthwise and sew the edges together. This will add a bit of structure to the hat so that its not smooshy. Sew the two shorter edges together to create a loop. Next pin the edge of the large white circle to the blue loop, you'll have to gather as you go, but just try and keep it as even as possible. Make sure that all the seams are on the inside of hat. When the hat is sewn together turn it right side out. Hurrah! You have made a hat. Use the black fabric paint to add detail to the red tie and the white fabric paint to write 'STAY PUFT' on the band of the hat. I used stitched the hat to the hood of the white outfit in a couple of places to keep it in place, but you could also use safety pins. The collar will tie on over the white outfit and your little one will be the cutest marshmallow man on the block.